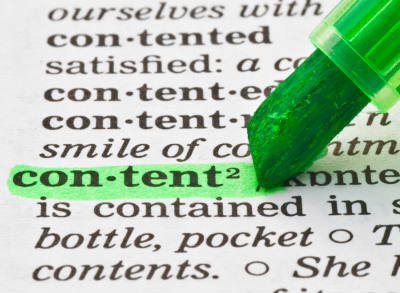 One of the marketing buzzwords that's been floating around for the past couple of years is "content marketing". Yet, despite how frequently it pops up on our radar, I get the distinct impression that many people either: a) don't know about it, b) haven't associated the name "content marketing" to a phenomenon that they have already engaged, or c) fear that it gives too much away. So, in the interests of filling in the gaps for people that fall into categories a and b, let's start with what content marketing is. In my research for this post, I found a blog post that lists 21 definitions of content marketing. I think the fact that the blogger of that post was able to pull together 21 different definitions of the term is helpful in understanding why content marketing is so badly understood. Another post highlighted 11 different synonyms for content marketing - again reinforcing why the concept is unclear in a lot of people's minds. So, in sharing what I'm about to, my intent is not to add more confusion to an already confused topic. Rather, my hope is to clarify it - to bring it down into its simplest form in language that regular people use. Content marketing - Sharing the ideas, knowledge and experience that you have on a specific topic in order to establish yourself as credible and valuable in that area. If you want an example of content marketing - then I can tell you that you're looking at it right now. Our blog is content marketing. It's us sharing our ideas, knowledge and experience with you for free. By means of this blog, we are hoping to help you. But we are also hoping to grow our market, both in depth and size. We want you to grow in your appreciation for our knowledge base and as such, more-and-more come to think of us as your go-to resource for marketing, advertising and branding. If we've done that, then we also hope that you will want to share that appreciation for us with your friends, or that our name will pop up when someone asks you: "Hey, by the way, do you know of any good branding agencies?" Of course, the onus is on us to provide you with content that is valuable to you - content that helps you and people like you. Content marketing, therefore, starts with the audience - it's all about you. It also ends with the audience because it's up to you to do something with it. We can't force your hand in it and so the success of an organization's content marketing lies in your hands. There's a lot more that could be said by way of definition and clarification, but this is a blog post, not a book, so I'll move on because I still have to deal with that third group: those people that think content marketing is risky because you're giving your expertise away. The chief complaint or concern that I have heard surrounding content marketing is that engaging in content marketing essentially means you are giving away the very ideas, knowledge and experience that make you valuable to others - those skills and experiences that are the reason people hire you or give you money. The fear therefore, is that content marketing will cannibalize your market. The reality though is that this doesn't happen. Knowing is only half the battle. Applying that knowledge is an entirely different thing and it takes time, effort, knowledge and experience to apply well. If you don't believe me, think about people who go to church. The reality is that churches don't really offer anything that you can't get online. You can access the Bible. You can watch sermons. You can listen to religious music. You can connect with friends of like faith. And yet, people still go to church week-in-and-week-out - they have for hundreds and hundreds of years. Why? Because there's more to church than just facts and videos. From a corporate or organizational perspective, if you think about it, there's a lot of stuff available on the Internet these days. You could probably gather all the knowledge you'd need in order to become a lawyer if you wanted to by just reading books and checking out online resources. Then you could handle your organizations legal needs. But no one is going to do that, particularly when they are busy with another job. Furthermore, in a discipline like branding, agencies everywhere have been marketing their content for years and as a result, everything you'd need to brand well is there at your fingertips. Yet, there are a couple of things that are still missing. As mentioned above, the ability to apply those learnings well and efficiently is one of them. The other is perspective. One of the biggest things that we bring to the table when we enter into a relationship with a client is a fresh perspective. We can look at the issues the client has been struggling with for years and immediately identify the problems and provide solutions. That kind of perspective is invaluable and can't be given away via content marketing. The same is true of any discipline. There's an element of experience and 'gut instinct' that content marketing will never be able to replace.